I mentioned yesterday that often my daughter's perspectives were tilted, seemingly at random, when she took photos. But this one is interesting - she carefully lined up the fence at the bottom of the frame - much more important, really, than the horizon line! This shot is on Mitchelltown Road, just a quarter mile from the main road. What a lovely scene. Your daughter did an amazing job. That's an absolutely beautiful shot. Love this photo. My sister would love to have this photo I bet. She has two horses of her own now. Wow. What a view. What a photographer. 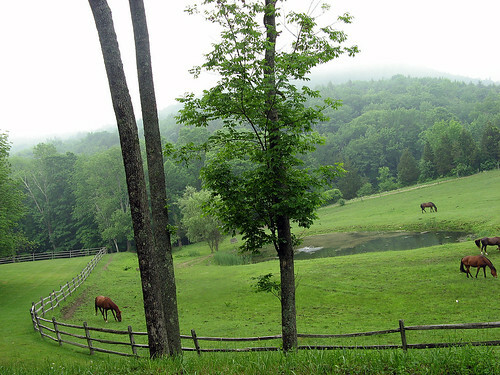 Very nice scene with the horses in the pasture. SHE IS SO VERY TALENTED. MOST ADULTS WOULDNT HAVE HAD AN EYE TO CAPTURE THE ANGLE AND LINES OF THIS REALLY EXCELLENT PHOTO.